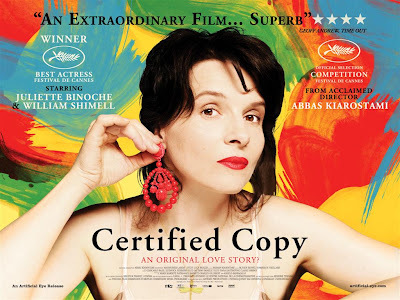 In Certified Copy, Kiarostami harks back to his favorite question of the supposed divide between art and originality (divide between cinema and life, as we know them) and skillfully weaves his tale around two characters while examining his central theme that nothing is really original and that we all assume roles in our lives. This is a recall of the themes he masterfully examined in Close Up. James Miller is a British author on a tour of Tuscany where his work on originality in art has been better received than in his homeland. Binoche is the woman who comes to hear his talk, and the two are then drawn together in a discussion of his work. Once the two meet again, the course of the movie charts their discussions over the course of an afternoon, taking in the Italian countryside and engaging with a number of characters along the way who cause them to reflect on their differing viewpoints on author's work. There's a turning point as we approach the halfway mark where one of those characters seemingly mistakes the pair for a married couple. What starts as a role play, set off by the misunderstanding, takes on more and more aspects, and eventually both the pair and the audience are lost in the drama. The whole movie reveals itself to be an intricate construct on this concept, almost every aspect of the theme, the performances or the setting playing with the motif of originality versus imitation. Reflections in car windows sometimes obscure the actors themselves, point-of-view shots ask us to engage directly in the drama almost as a participant and this even extends to the leading pair themselves – The male lead is a renowned baritone, not an actor, and there is a slight but noticeable difference between his performance and that of Binoche, which almost feels like a copy of acting rather than being fully immersed in the role. While this reinforces the concept, it does prevent the audience from fully engaging, being kept slightly at arm's length by the constant artifice. That's not to say that there's not a lot to enjoy here, with the confusions and the tensions making this verge on a romantic comedy at times. Despite the differences in acting ability, Miller and Binoche make an engaging couple at times and as time wears on, you find yourself more keen to believe that the beginning was the illusion and that their relationship is real and not the copy. Much of the credit for this must be placed at Binoche's door, using the language differences to vary mood effectively, but also adding colour and emotion in all of the languages she uses. The only one here who's on familiar ground is director Kiarostami, who's explored these themes before but never to such mainstream effect – worth checking out if you'd like to engage your mind and your heart. Why see it at the cinema: There is a very literal aspect of the visuals which runs throughout the course of the film, which the cinema screen will allow you to fully appreciate. Ultimately, Certified Copy - with its unresolved loose ends - is a mystery box without a key. Kiarostami's best films are profoundly empathetic. By comparison, Certified Copy is a slighter but more ingratiating film and a chance to see a master filmmaker in uncharacteristic playful mode.